Powers and Abilities Can alter human perception. Feeds on its victim's brains with a thin, organic spike that protrudes from the wrist. Appearance Humanoid with sagging, decaying flesh. Can appear human. A Scottish word, first used in English in 1513. A wraith is an apparition, vision, or double of another living person. Its appearance is commonly seen as an omen that the person being doubled is about to die. Wraiths are humanoid creatures whose true nature—including their sagging, decaying flesh—can be seen only in reflection. They appear human except for the long, organic spike that they sheathe in their wrist and use to feed on their victims. 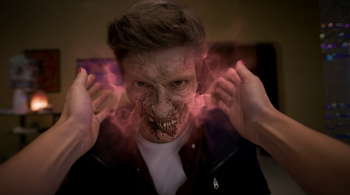 According to hunter Martin Creaser, wraiths "crack open skulls and feed on brain juice," and the wraith that Sam and Dean encounter has taken to feeding on victims in a mental institution not only to avoid discovery, but also because the chemicals that flood their brains are apparently delicious. Can alter the perceptions of any person they touch, making them hallucinate or unbalancing them emotionally. Can feed on a person's brains through an organic spike that extends from their wrist. Silver – Wraiths are highly allergic to silver. Piercing a wraith through the heart with silver will kill it. Silver also burns them when it touches their skin. In one case, just being stabbed in the side with a silver knife was enough to kill a wraith. Mirrors – A wraith's true form is revealed in a mirror. Psychics - Some can use their abilities to perceive their true form without a mirror. Snapping off the organic spike it uses to feed can disorient them, but it will grow back after a short period of time. Severe brain damage - Bobby Singer was able to kill a wraith by throwing a hatchet into its head. 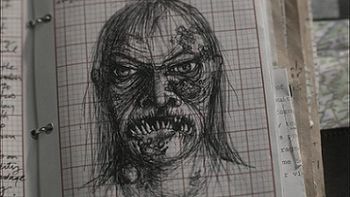 A wraith drawing from Martin Creaser's journal. Sam and Dean hunt a wraith disguised as a nurse in a mental institution. The wraith, who is known as Nurse Foreman, can alter human perceptions with a touch. She uses this ability to amplify her victims' mental imbalances, causing their brains to produce more chemicals like dopamine, which she likes to consume. She feeds on her victims' brains through a thin, organic spike that emerges from her wrist. She is about to feed on Sam when she is interrupted and killed by Dean, who stabs her with a silver-plated letter opener. Bobby mentions a ghoul-wraith smorgasbord along I-80. In Grants Pass, Oregon, Eve is experimenting with creating hybrid monsters. 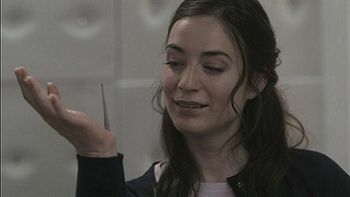 On examination of some of the hybrids in a bar, Dean finds they have strange hybrid attributes—one creatures has vampire teeth, but also the spike of a wraith protruding from its wrist. Dean dubs these hybrids Jefferson Starships. The psychic Dede is able to perceive the true face of the wraith. Ennis Ross briefly sees the reflection of a wraith named Marv, who was serving as a body guard to Sal Lassiter, when he goes to confront Sal and the maître d' at the restaurant where he planned to propose to his girlfriend. After back-to-back-to back hunts, Dean returns to the Men of Letters Bunker covered in ghoul, wraith, and siren gore. A wraith attends Mary Winchester's hunter's memorial at the Bunker, disguised as a hunter who knew Mary. Unlike the other hunters, he doesn't raise a toast to Mary, instead standing in the back with his arms crossed and a smirk. To the shock of the gathered hunters, the wraith is suddenly killed by Bobby Singer with a hatchet thrown into his head. Bobby explains that he recognized the wraith from the nest he and Mary had hunted down the last time they worked together and guesses that the wraith was present to gloat. Castiel comments about how Mary got a hunter's memorial complete with a monster and would've appreciated that, something that Bobby agrees with. In the spin-off novel Supernatural: Heart of the Dragon, it is mentioned that the first creature Samuel Campbell (Sam and Dean's maternal grandfather) killed as a teenager was a wraith. Samuel managed to kill it before it tried to feed on him, but not before his best friend fell victim. A wraith is commonly described as a ghost or spectre, and has been more specifically defined as "the exact likeness of a living person seen usually just before death as an apparition." Wraith is a Scottish dialectal word for "ghost, spectre, apparition." It came to be used in Scottish Romanticist literature, and acquired the more general or figurative sense of "portent, omen." In 18th- to 19th-century Scottish literature, it was also applied to aquatic spirits. The word has no commonly accepted etymology; the Oxford English Dictionary notes "of obscure origin" only. An association with the verb writhe was the etymology favored by J.R.R. Tolkien. Tolkien's use of the word in the naming of the creatures known as the Ringwraiths has influenced later usage in fantasy literature.